The bar chart below shows the results of a survey to find out why Chinese and Indian university students want to learn English at university. The survey had 10,000 participants. 1.The bar chart shows the results of a survey. 2.10,000 people were interviewed. The participants were Chinese and Indian university students. 4.The most popular reasons amongst the Chinese students for learning English were that it was useful for work and could improve job prospects. In addition it was thought to be enjoyable and useful for travel. Around 90% of the students interviewed gave these reasons. 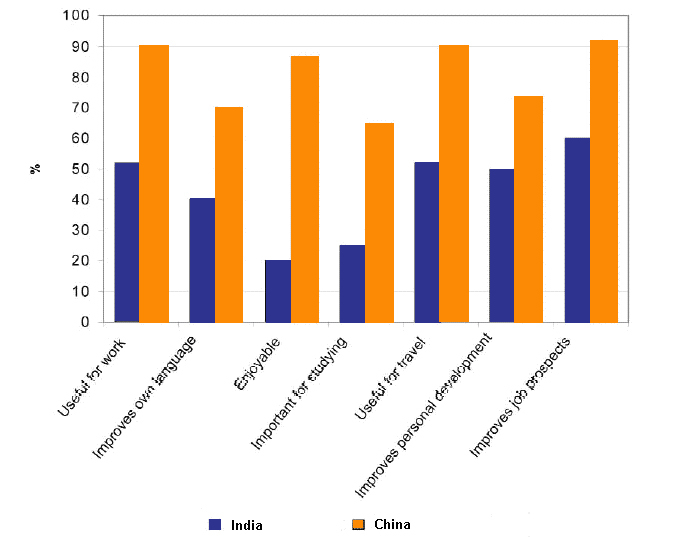 5.The most popular reasons amongst the Indian students for learning English were that it was useful for work and could improve job prospects. In addition it was thought to be useful for travel. Around 50 - 60% of the students interviewed gave these reasons. 6.The least popular reasons amongst the Indian students for learning English were that it is important for studying and enjoyable. These statistics were all around 20 -30%. The least popular reasons amongst the Chinese students for learning English were that it improves their own language, is important for studying and improves personal development. Around 70% of the students interviewed gave these reasons. 7.The least popular reasons amongst the Chinese students for learning English were that it improves their own language, is important for studying and improves personal development. Around 70% of the students interviewed gave these reasons. Overall the Chinese students were more positive with the most popular reasons for learning English being that it was useful for work and could improve job prospects. In addition it was thought to be enjoyable and useful for travel with around 90% of the students interviewed giving these reasons. Similarly, the most popular reasons amongst the Indian students for learning English were its' usefulness for work and travel, and its ability to improve job prospects with slightly over half the participants giving these reasons. Interestingly among the Indian students, enjoyment was not something that was thought to be an important factor nor its importance for studying with around a fifth stating these preferences. Conversely, 70% of the Chinese students thought learning English was is important for studying and that it improves their own language as well as their personal development. In general the graph shows that Chinese students are more positive about learning English than Indian students.